Every November, the sleepy little township of Pushkar in Rajasthan, India comes alive with a riot of colours and a frenzied burst of activity. The occasion: PUSHKAR FAIR. Very few, if at all any, fairs in the world can match the liveliness of Pushkar. Most people associate the Pushkar Fair with the world's largest camel fair. But it is much more than that. It portrays vivid images of the rich culture and the benevolent face of this mesmerizing state. This popular tourist destination is also known as the land of Lord Brahma. It has the only temple dedicated to the creator of the universe Lord Brahma in the entire country.Over 50,000 camels find their way to the Pushkar Fair to be traded off or display their best features, beauty and tricks - yes, that's true. Pushkar Fair brings you unique competitions that are as funny as they are entertaining. These include Camel Beauty Contest, where camels vie with each other adorned with painted motifs and wearing beautifully embroidered and mirror-worked saddlecloth. Camel Race and Camel Dance are other highlights of the fair. Highlights: Rajasthan’s most famous fair, Pushkar brings together camel traders, pilgrims, visitors and those who are here simply to participate in one of the season's most colorful social events. It is one of the largest and most colorful animal fairs in the world. Besides tented camps, there are hundreds of shops selling everything from handicrafts to spices, foodstuff and jewelery. For visitors, a number of activities are also arranged, but the best is to simply stay within the fair grounds to watch the fascinating Rajasthani village metamorphose before your eyes. 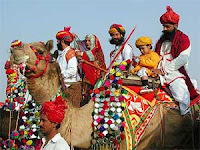 Pushkar Fair is from 2nd till 10th November'11. Pushkar fair is popular both religious & adventure points of View. this year Pushkar Fair 2011 will be celebrated in the month of November. Thanks for sharing such informative post regarding the pushkar fair 2011, I was searching the same, now it will help a lot.